ST. GEORGE — Utah Highway Patrol has released the name of a man who died Saturday afternoon on state Route 7, also known as Southern Parkway, after driving his Corvette at a high rate of speed, launching the vehicle airborne and crashing it into a guardrail just west of River Road. 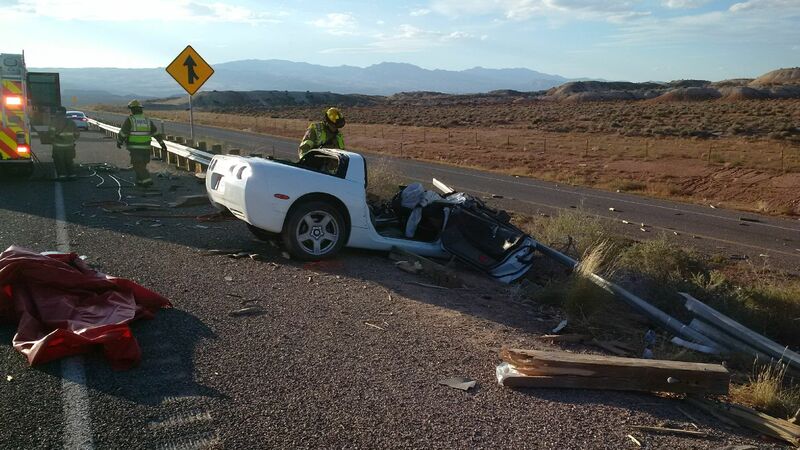 The driver of the Corvette, confirmed dead at the scene, has been identified as Colin D. Wiest, 32, of St. George, according to a statement released Sunday by UHP. The medical status of the passenger in the Corvette, Dustin L. Cummings, 27, of Washington City, was unknown as of 3:30 p.m. Sunday, according to the statement. UHP investigators have been performing further accident reconstruction at the crash scene Sunday to determine how fast the Corvette was speeding, UHP Sgt. Danny Ferguson said. Very sad and tragic. They were much too young. May this be a lesson that traffic laws are there to protect yourself and others and even if you feel comfortable going past those limits don’t do it! You never know how many people you will hurt both physically and mentally. Yes, much too young to die, but certainly old enough to have better sense than to endanger themselves and others with this foolish, thoughtless behavior. WHAT?????? There are driving laws that we have to follow here in St. George. No way. Prayers and comfort to the families during this difficult time….